Recently, Sunset Magazine wrote a wonderful piece about our fair city. They raved about all the wonderful things you can do in just one weekend while visiting our little town. Anyone who lives here already knows what makes it such a great place to live. But it's nice to know that someone else recognizes all the fantastic things that make Tucson a great weekend getaway spot. With its location so close to the US/Mexico border, the authentic Mexican food scene in Tucson is astounding. Sonoran food, in particular, deserves its own parade. But what really makes Tucson a great weekend getaway is its diverse melting pot of amazingly talented chefs in all cuisine. And what goes better with great food than excellent drinks? Hamilton Distillers makes award-winning whiskey right here in Tucson. Several breweries create fine handcrafted beers locally. Also, a few unique bars and lounges cater to anyone interested in having a good time somewhere that doesn't remind them of where their forefathers might have imbibed. 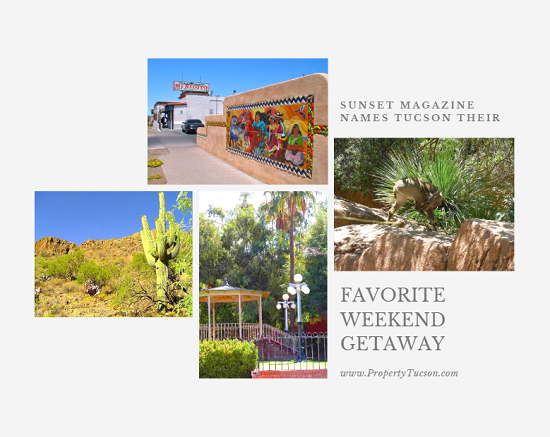 Another reason Sunset Magazine named Tucson their favorite weekend getaway was the weather. Even in the coldest parts of winter, we typically experience highs in the mid-60s. In the spring and fall, we see temperatures more in the mid-80s range. And in the very heart of summer, we skim 100F during peak hours. But mornings and late evenings cool off enough to still enjoy the great outdoors. With the gorgeous Saguaro National Park to the east, north, and west, exploring the outdoors is a must on your weekend getaway. Filled with beautiful flora and fauna, the park offers a desert wonderland for hikers, bicyclists, and offroad trekkers. For a closer view of our natural neighbors, visit the Arizona-Sonora Desert Museum. Their collection of live mammals, reptiles, fish, birds, and insects forever changes your idea of what to expect at a "stuffy museum". Over 130 miles of bike-friendly pathways around the city make Tucson one of the best cities to bicycle around in the entire country. Finally, you'll want to make Tucson your favorite weekend getaway when you realize how budget-friendly it can be. As a college town (the University of Arizona at Tucson), the population includes thousands of college students. They bring a youthful, vibrant energy to the city. And when you hear "student", you think "no money". Many local restaurants cater to budget-minded students with great food at a low cost. But you don't have to be a student to take advantage of these deals. They're available to everyone. As you can see, there are many reasons why Tucson makes a great weekend getaway. When you live here, you can take advantage of what we have to offer every weekend. If you're interested in finding a permanent weekend getaway in Tucson, contact me. 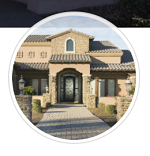 I'd be happy to show you what is available for sale around town.